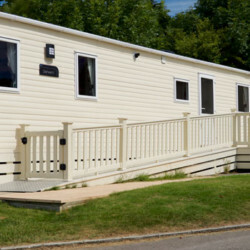 Mayfield’s uPVC access ramps are an ideal addition to your static caravan or holiday home decking. Creating safe access to your holiday home using the same sturdy deck boards as your decking, it is perfectly colour matched to the whole deck. Access to your deck is critical. This is why all our access ramps for caravans are designed to DDA specifications. The static caravans access ramps are easily incorporated into one of our decks allowing space and easy access to those who need assistance. The aim of our decking ramps is to make entry to your home easier as well as compliment your decking. 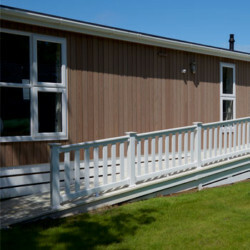 Two styles of decking access ramps are available, either straight or return, to suit any pitch.